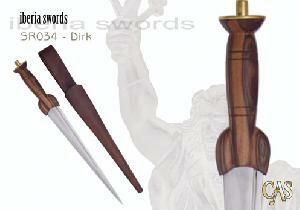 The Dirk (SR034) is patterned after an early model (circa 1700) and is similar in form to earlier ballock knives. The blade is “backed” (single-edged and wedge-shaped in cross section). The hilt is hand carved in Macassar ebony.